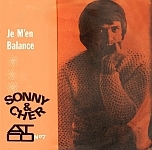 All recordings produced by Sonny Bono and arranged by Harold Battiste, Jr., with French and/or Italian vocals overdubbed on original monaural 45 track mixes. 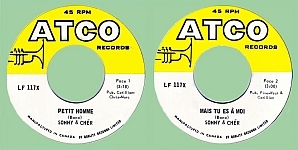 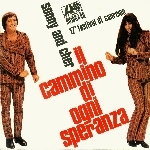 Atco 117x (Canada 45) SONNY& CHER": "Petit Homme" / "Mais Tu Es A Moi"
See HERE for Sonny & Cher LPs featuring "Je M'en Balance" and "Petit Homme"
Atlantic 90195 (Italy 45) SONNY & CHER: "Little Man (versione Italiana)" / "Set Me Free"
Drum and mandolin opening edited from this track. 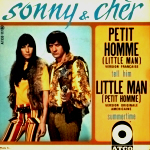 Atlantic 02005 (Italy 45) SONNY & CHER: "Caro Cara (It's The Little Thing(s)" / "Fantasie (Don't Talk To Strangers)"
(A) Liberty 12049 (Italy 45) CHER: "Ma Piano (Per Non Svegliarmi)" / "Nel Mio Cielo Ci Sei Tu (Magic In The Air)"
(B) Liberty LBLP 902 (Italy LP. 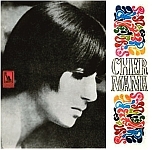 1967) contains the above tracks. 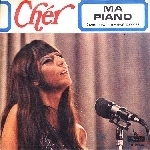 Liberty 9022 (Italy 45) CHER: ""The Click Song Number One" / Bambini Miei Cari (You Better Sit Down Kids"